Languages at Bewdley include French and Spanish as courses of study which all students follow for one tenth of their curriculum time in the lower school. The school is also exploring the potential for exposure to other United Nations Languages through international partnerships in the Middle East and China. Overseas visits support our language learning and the school regularly has visiting students from around Europe study alongside our Sixth Formers. Following a year of each, students choose either French or Spanish for the first half of year 9 but can choose either or both as a GCSE option which starts half way through the year. The school also offers both subjects at Advanced Level with high quality individual support from team of specialist teachers skilled in these and other languages. 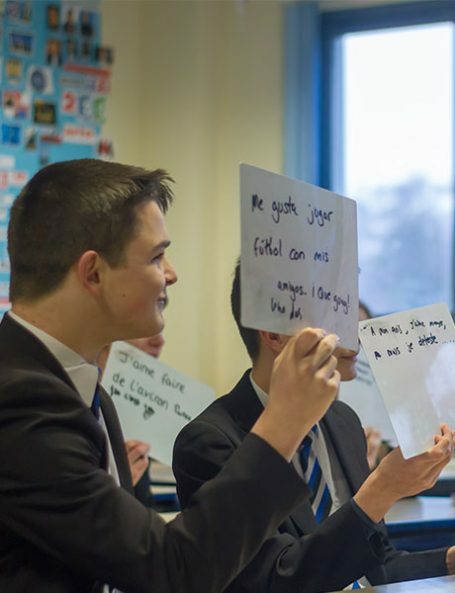 The work covered in the year 7 French course aims to provide pupils with a solid foundation of language and structures to enable them to progress well in French in future years. A variety of language learning skills will be developed within a topic based scheme of work and an emphasis is placed on both the enjoyment of learning the language as well on developing confidence in language use. Pupils are expected to complete regular tasks to consolidate and extend the material covered in lessons and are encouraged to converse in French within the classroom. Assessments in ALL skills throughout the year. The work covered in the year 9 French prepares students for GCSE. Students are encouraged to speak in the Target language in lessons. All skills are assessed throughout the two terms focusing on exam skills including role play, picture description and presentation. The work covered in the year 10 French helps all students achieve their potential in GCSE French. The course develops listening, speaking, reading and writing skills and includes a focus on skills such as translation, understanding authentic and literary texts and spontaneous speaking. Students are encouraged to speak in the Target language in lessons. All skills are assessed throughout the two terms focusing on exam skills, in order to track students’ progress and help them achieve their best at GCSE.